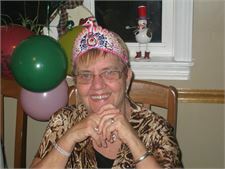 The passing of Margaret Rose (Urquhart) Kervin of Blissfield, NB, wife of the late Donald Everett Kervin occurred peacefully, but unexpectedly on Sunday, March 24, 2019 at the Miramichi Regional Hospital surrounded by her family. Born on December 31, 1943 in Upper Blackville, she was the daughter of the late Ralph and Faye Urquhart. She was a devout member of several churches but her heart was with the New Zion Baptist Church. Margaret is survived by her sons, Eldon Ralph Campbell (Janet) of Moncton and Thomas Carl Campbell (Lyanne) of Waasis; her stepchildren Mary Torres of Blissfield and Steven Kervin (Rhonda) of Fredericton; her sisters, Carolyn Peterson (Late Sandy) of Oromocto, and Kathy Arbeau (Rickey) of Blissfield; her brother, Steven Urquhart (Kelly) of California; her grandchildren, Jonathan Munn (Jennifer) , Jesse Campbell (Jennah), Brandon Campbell, Emily Campbell, Jordan Campbell (Shallon); her great grandchildren; Connor, Kennedy, Cameron, Kassie and Billie Dawn Katie Campbell also several nieces and nephews. In addition to her parents and husband, she was predeceased by her infant son William and step daughter Gloria. Margaret Rose (Urquhart) is resting at New Zion Baptist Church, Howard Road with visitation on Wednesday from 2-4 & 7-9. The Funeral Service will be held on Thursday at 2 pm at New Zion Baptist Church with Pastor Paul Inman officiating. Burial will follow in Upper Blackville Baptist Cemetery at a later date. In Margaret’s Memory, donations to New Zion Baptist Church or Salvation Army would be appreciated by the family. Arrangements are in the care of Davidson’s Funeral Home, 622-7464 or online at www.davidsonsfh.com, your family-owned, family-operated funeral home.